This bride's fiancé designed her wedding outfits himself - NO, we are NOT kidding! Meet Utkarsh and Resham - a beautiful couple who tied the knot in a big-fat desi wedding way in Delhi where everything right from the wedding planner to the decorator was on point. "It was probably the biggest challenge I gave myself, to create something more beautiful and more extravagant than I had ever done, to use every knowledge and essence of the craft of couture inside me. Also, to create a lehenga that was an honest reflection of who she was, was itself a beautiful journey of getting to know her better. 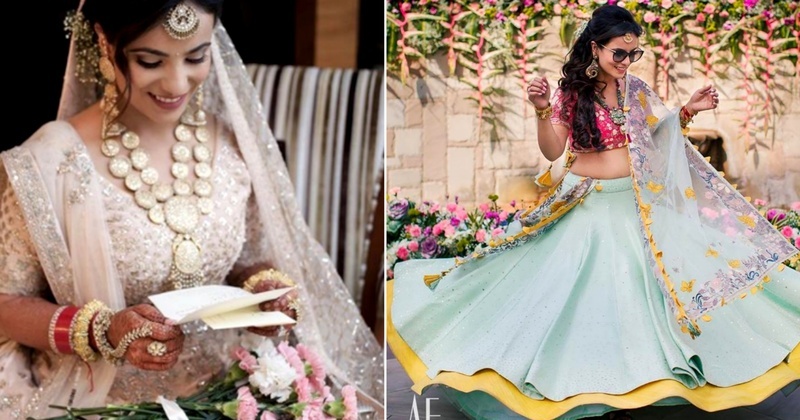 She deserved the most beautiful lehenga in the world and I hope I came a little closer to making something as perfect for her as humanly could be." *Awwwwww*! the icy blue sheer dupatta. With minimal makeup and jewellery, Resham's mehendi look was right out of a fairytale. Next up, for the Wedding, Utkarsh chose to design a peach-ish embellished lehenga for his beautiful bride and it was just amaze! "I knew he was a visionary and a perfectionist from the moment we started talking. So, when he told me that Matsya would design all the outfits, I was more than overjoyed. Throughout our courtship, I had no idea what was brewing and in fact, I saw my bridal lehenga just a few weeks prior to the wedding. But, I was pretty certain that it would be a Matsya Masterpiece. And I was right! Turns out, you CAN fall in love at first sight! He had beautifully integrated my essence in this blush pink lehenga, handcrafted with Love. Gorgeous trees, playful deers, liberated birds- he created a joyful fairytale on the canvas of the lehenga- and on my heart!" What do you think about Resham’s outfits? Well, we totally adore them & wish the lovely couple a lifetime of togetherness!